Illinoisans think the state’s criminal-justice system is broken and are ready to embrace cost-effective, results-oriented reforms, according to a new Illinois Policy Institute-commissioned poll. According to the results, a majority of Illinois’ registered voters – 58 percent – feel the state’s criminal-justice system has been ineffective at keeping communities safe. At the same time, 56 percent of registered voters also believe the system to be unfair. 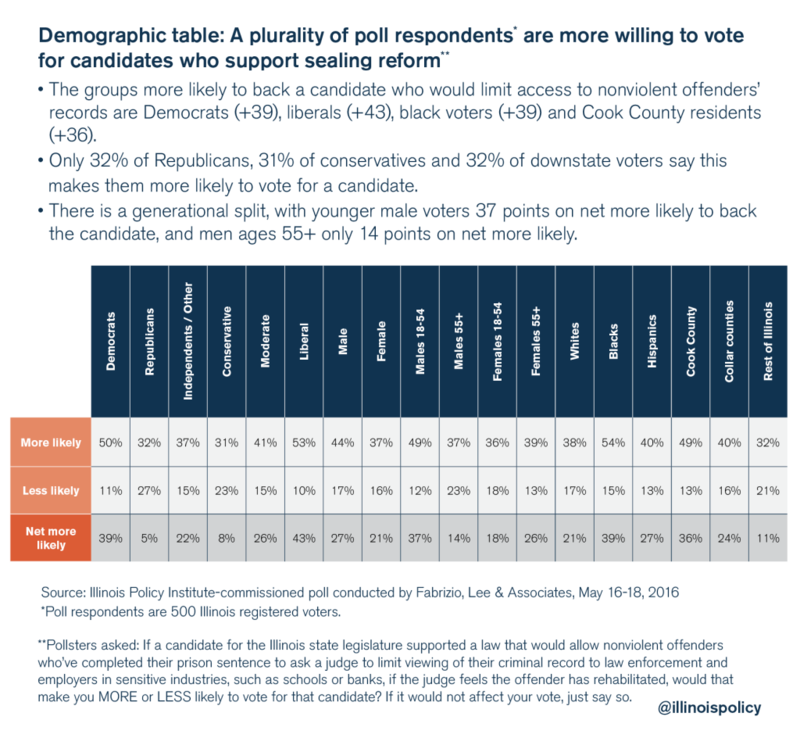 Because of these problems, registered voters across the political spectrum support continued criminal-justice reform and are more likely to favor candidates who support reform as well. 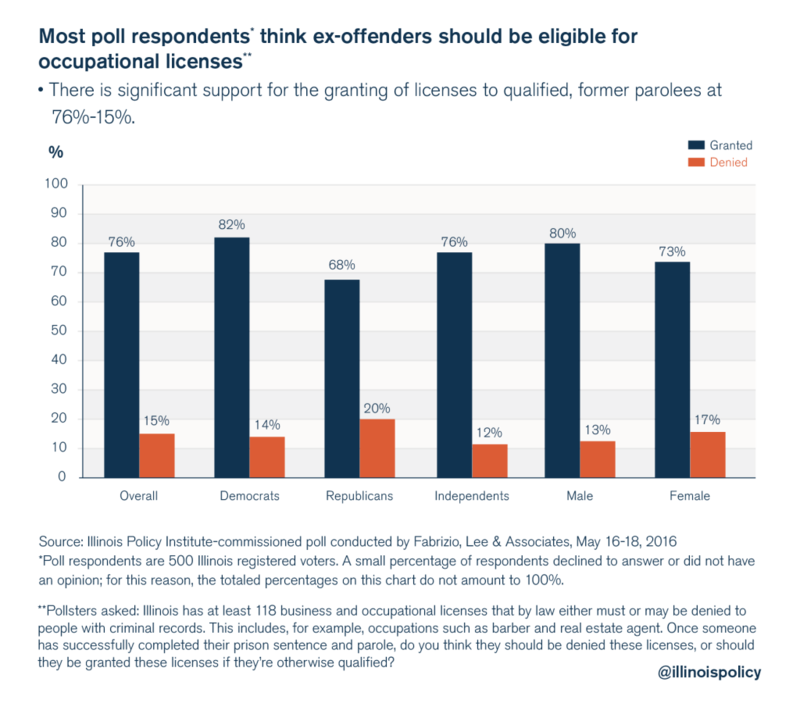 Democrats, Republicans and Independents all widely support reducing sentences for nonviolent offenders, removing legal barriers to employment after incarceration, reforming the state’s civil asset forfeiture laws and replacing money bail with a risk-assessment system. 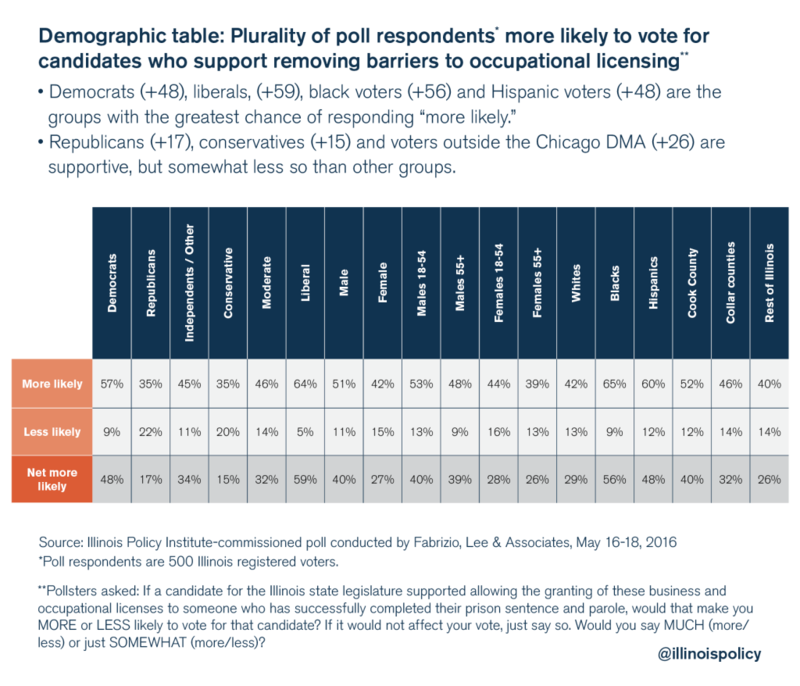 The poll, conducted by Fabrizio, Lee & Associates from May 16 to May 18, 2016, highlights what voters think about Illinois’ criminal-justice system as it functions today, and what they think needs to be changed. The poll surveyed the opinions of 500 registered voters in Illinois and has a margin of error of 4.28 percent. Advocates, reformers and policymakers should use this poll as a guide. 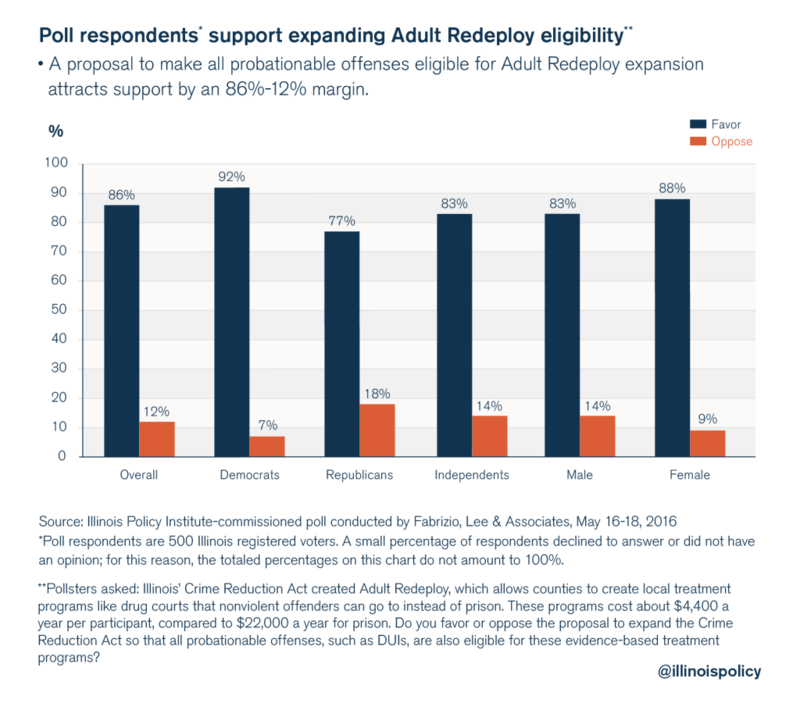 It shows which reforms already have widespread support, which topics have less support and should be the focus of education campaigns, and how different groups of people vary in their feelings about reform proposals. After decades of prison population growth and a nearly 50 percent recidivism rate, Illinois has finally started taking important steps to improve criminal justice. In February 2015, Gov. Bruce Rauner formed the bipartisan Illinois State Commission on Criminal Justice and Sentencing Reform to address chronic problems in the state’s corrections system and propose substantive reforms. Rauner tasked his commission with developing policies to safely reduce Illinois’ prison population by 25 percent by 2025. Restricting juvenile transfers: Public Act 99-0258 stops automatic transfers to adult court for juveniles who are 15 and limits the transfer of juveniles ages 16 and 17 to cases involving only the most serious crimes. Opening up licenses for health care professionals: Senate Bill 42 would allow those with certain felony convictions, such as burglary, to apply to work in health care professions after a post-conviction waiting period. Setting clear standards for barbering/cosmetology, roofing and funeral services licensing: House Bill 5973 would prohibit the Illinois Department of Financial and Professional Regulation from barring former offenders from working in certain fields unless their crimes directly relate to the occupations for which they seek licenses. This applies to licensing in seven fields: barbering, cosmetology, esthetics, hair braiding, nail technology, roofing and funeral service. Decriminalizing possession of small amounts of marijuana: Public Act 99-0697 makes possession of less than 10 grams of marijuana a civil offense punishable by a fine of between $100 and $200, instead of time in jail. Removing expungement fees for those who’ve had charges dropped or dismissed in Cook County: House Bill 6328 establishes a pilot program in Cook County that removes the $120 in expungement and sealing fees for anyone charged with an offense that resulted in “release without charging,” arrests resulting in “acquittal, dismissal,” or a conviction that was later vacated or reversed. It also amends the law to allow those with convictions to petition to remove other charges that did not result in conviction from their records. Despite the real progress made in recent legislative sessions, the most substantial reforms lie ahead. The governor’s goal of a 25 percent reduction in the prison population by 2025 requires the total number of inmates to drop to about 36,661 people over the next nine years.9 As of June 2016, the Illinois Department of Corrections held 44,701 inmates – a difference of 8,040 people. 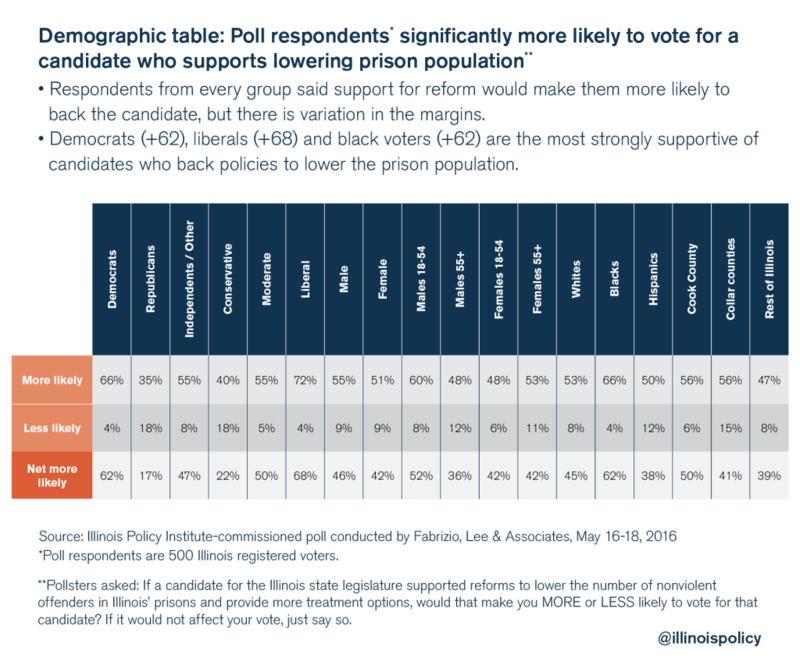 This report examines the results of the registered voter opinion poll on these policy proposals to improve Illinois’ criminal-justice system. The poll respondents expressed little faith in the state’s criminal-justice system. For the billions of dollars the state spends on it each year, most respondents are not impressed with the results. The poll bears these feelings out via two questions. 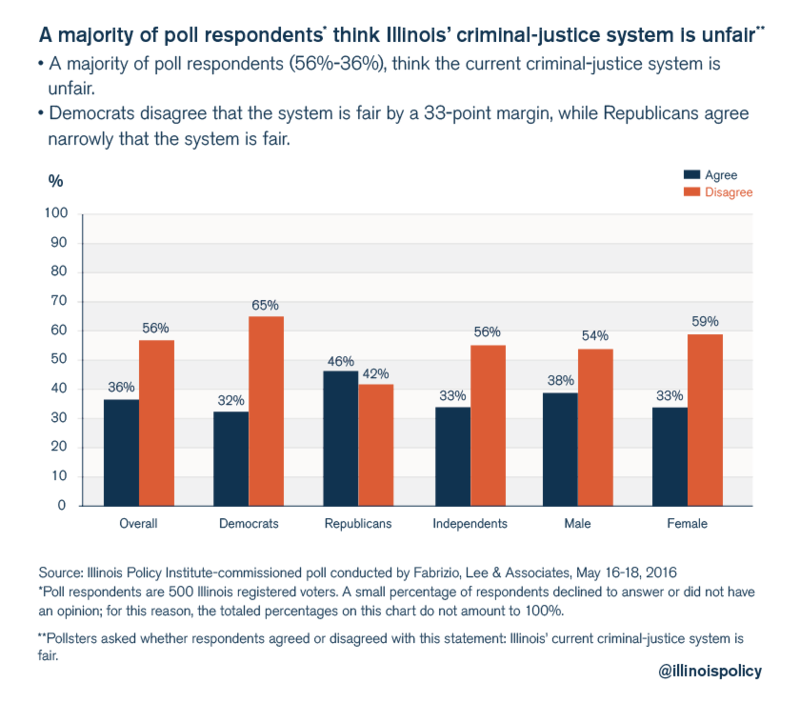 Pollsters first asked whether or not voters consider the Illinois criminal-justice system to be fair. A majority of respondents, 56 percent, feel that the Illinois criminal-justice system is unfair. 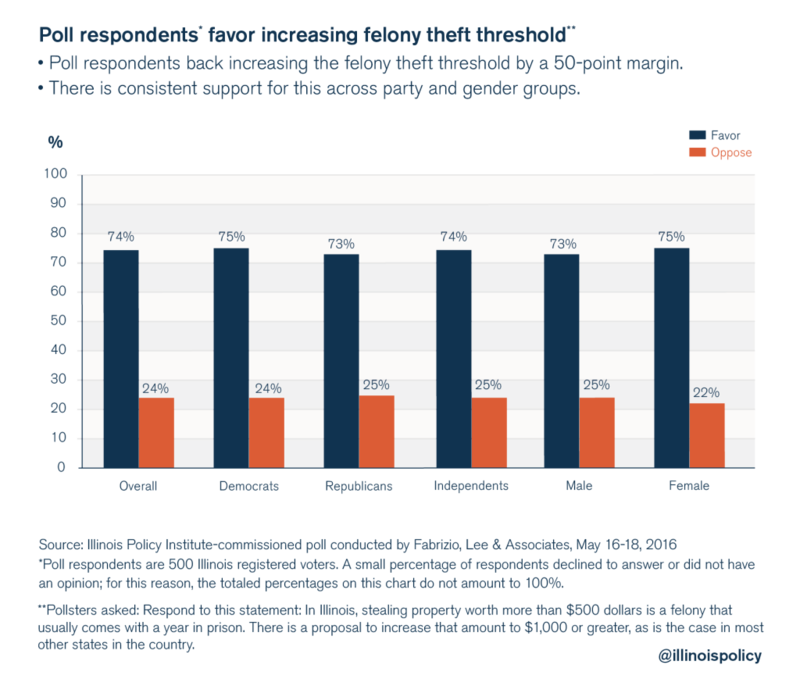 There is something of a partisan divide here: 65 percent of Democrats and 56 percent of Independents see the system as unfair, while only 42 percent of Republicans feel the same way. Next, pollsters asked if voters think the Illinois criminal-justice system is at least doing a good job of keeping communities safe. 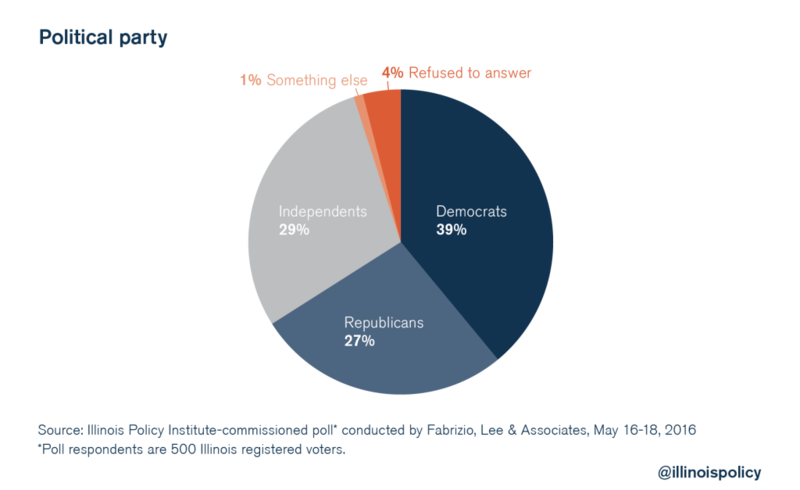 Bipartisan majorities don’t think it is: 58 percent of Democrats, 52 percent of Republicans and 65 percent of Independents do not believe the Illinois criminal-justice system, as it stands now, is doing a good job at keeping communities safe. 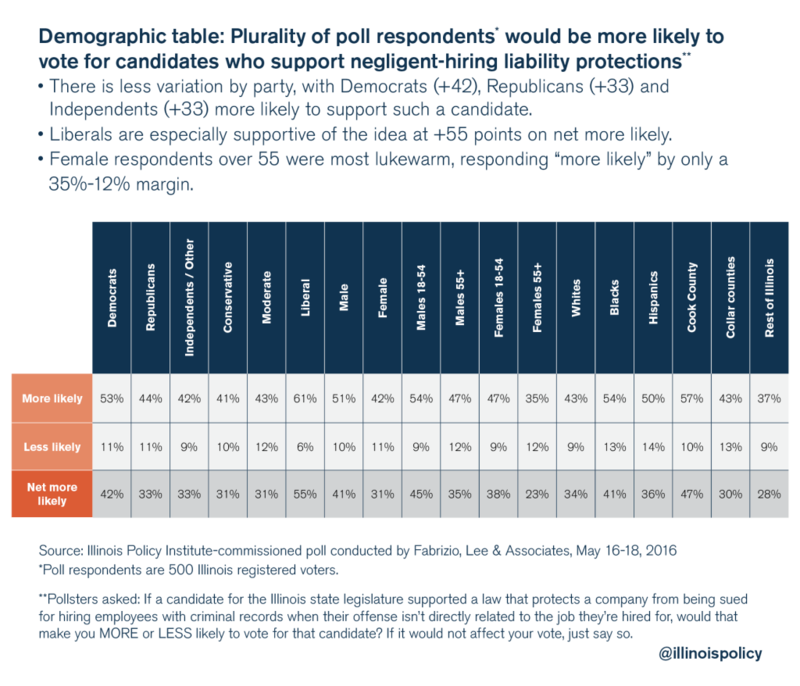 Given widespread concern about Illinois’ criminal-justice system, pollsters next asked respondents about some of the most popular reform proposals, beginning with suggestions to update how Illinois sentences nonviolent offenders. Between 1989 and 2014, 55 percent of the increase in prison admissions was due to more individuals convicted of Class 4 felonies. 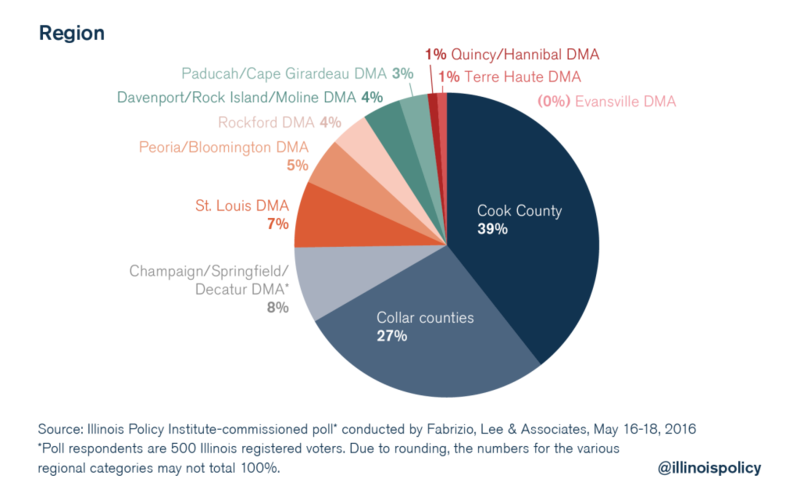 Today, Class 4 felony offenders make up the largest sector of incoming inmates in Illinois, accounting for over 37.7 percent of all admissions. 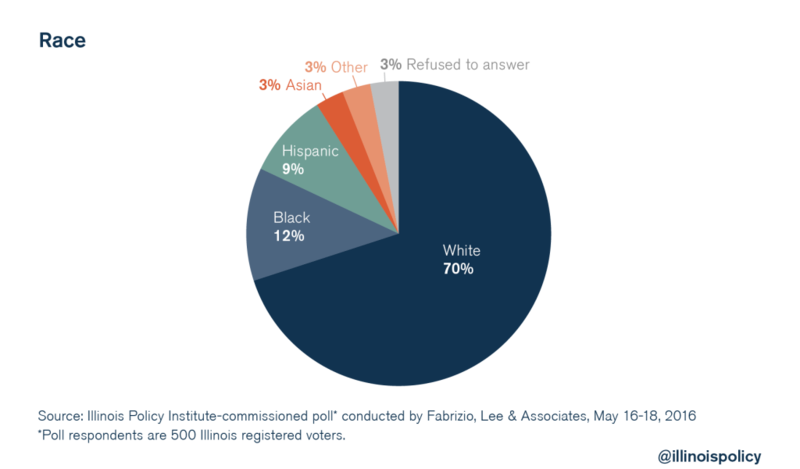 The percentage of inmates incarcerated for Class 4 felonies has shot up faster than any other felony class – these inmates made up 11.9 percent of Illinois’ prison population as of 2013, compared with 4.1 percent in 1993. 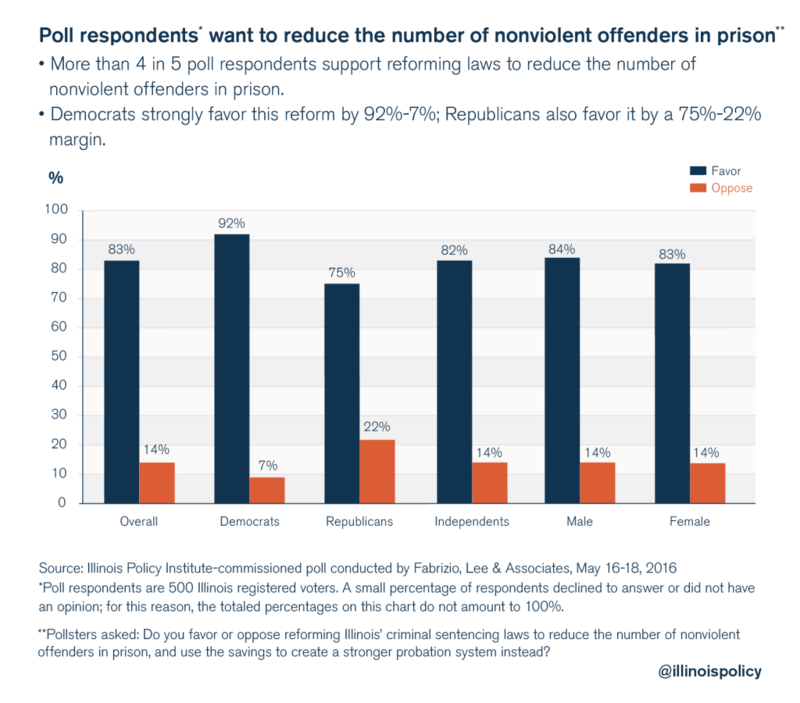 To see how voters feel about these issues, pollsters asked respondents about the length of nonviolent sentences and reducing the number of nonviolent offenders in prison. Overall, respondents tend to think that sentences for nonviolent offenders are too long. Democrats and Independents are more likely to think this than Republicans, who are most likely to think sentences tend to be just right. 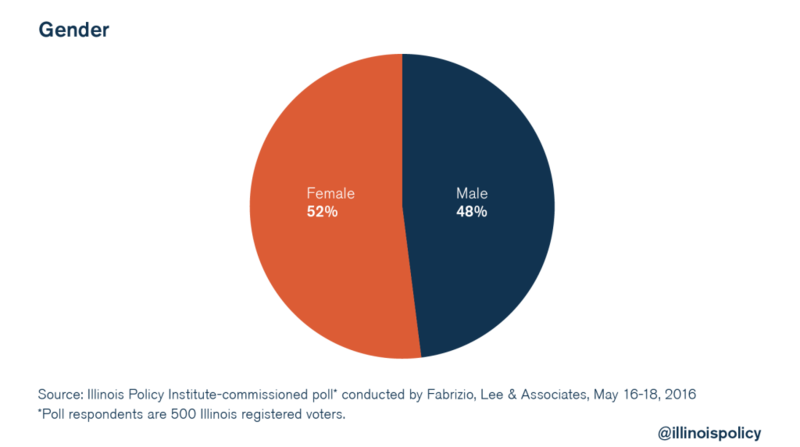 Male respondents are slightly more likely than females to think sentences are too long. 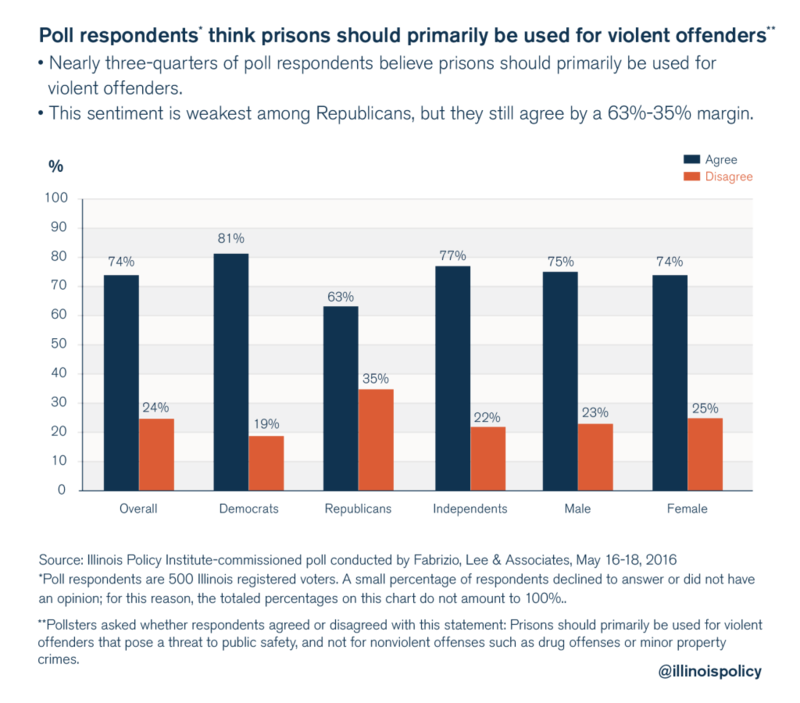 Another insight the poll revealed is that respondents want to prioritize prison sentences for violent offenders instead of those guilty of nonviolent drug or minor property offenses. They also want to reduce the overall number of nonviolent offenders in prison. 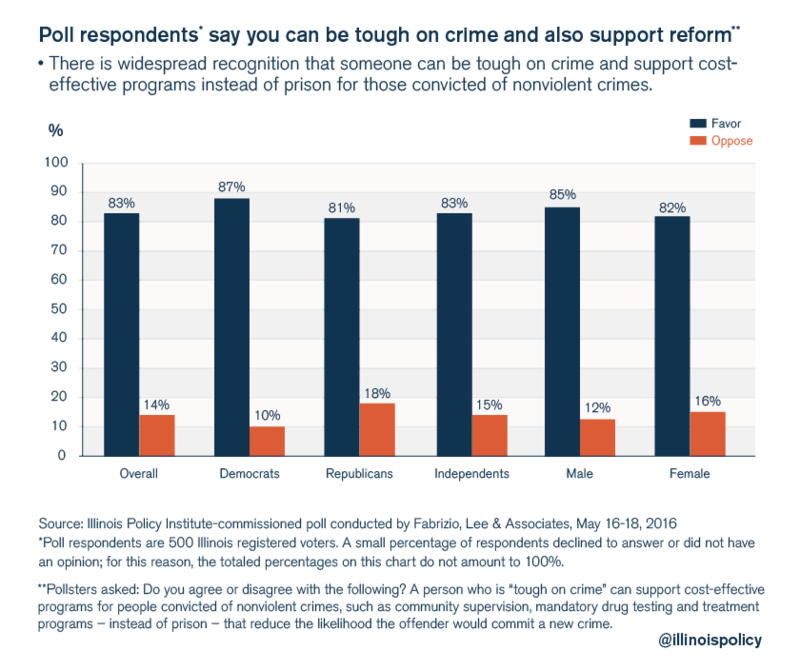 Nearly three-quarters of Illinois poll respondents believe prisons should primarily be used for violent offenders. More than 4 in 5 respondents support reforming laws to reduce the number of nonviolent offenders in prison. 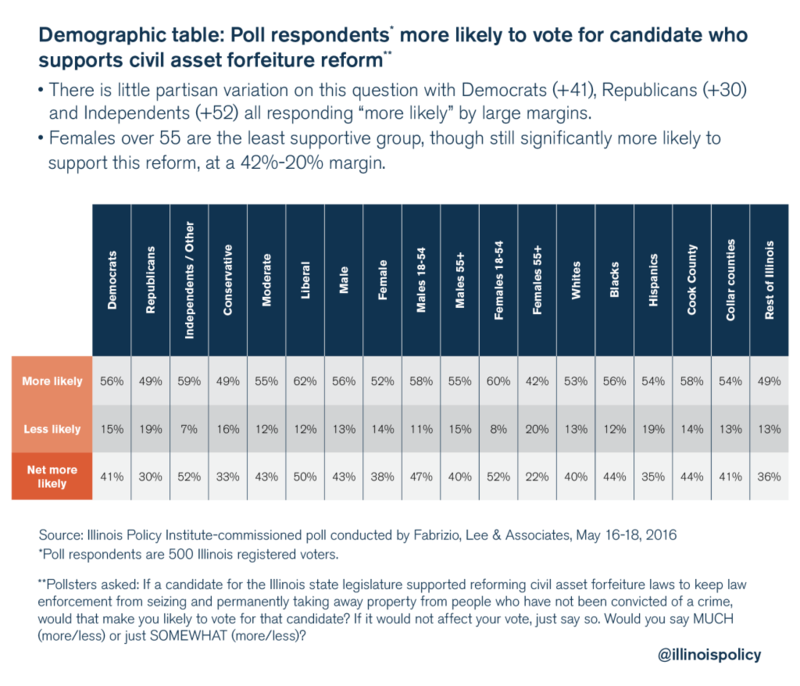 Democrats are most likely to favor this reform at 92 percent, but Republicans are also largely in favor by a 75-22 percent margin. Next, pollsters asked about some policies Illinois could adopt to lower its prison population. One approach Illinois could consider is to decriminalize possession of small amounts of controlled substances or create a threshold that triggers felony drug possession. Changing possession of small amounts to a misdemeanor would relieve prison crowding, as a misdemeanor comes with jail time of under a year, while the lowest-level felony can lead to a prison sentence of between one and three years. 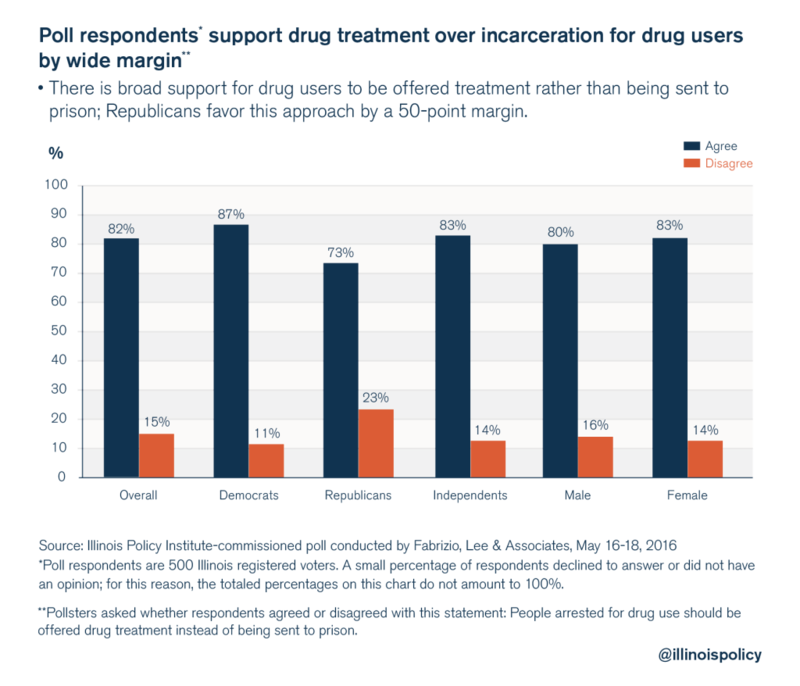 Eighty-two percent of respondents – including 87 percent of Democrats, 73 percent of Republicans and 83 percent of Independents – agree and want drug users to be offered treatment instead of being sent to prison. Property offenses are another category of nonviolent offenses that lawmakers could address. Illinois stands out among most other states for its relatively low felony theft threshold. Theft of more than $500 of goods – and sometimes even $300 – is a felony in Illinois. Most states in the country, however – 29 other states – have felony theft thresholds that are twice that or even higher. In Texas and Wisconsin, theft below $2,500 is generally a misdemeanor, a limit five times greater than in Illinois. One proposal to address this would be to raise the felony theft threshold so that theft offenses in Illinois are punished at a level similar to other states. The evidence shows this can be and has been done without leading to an increase in property crimes. 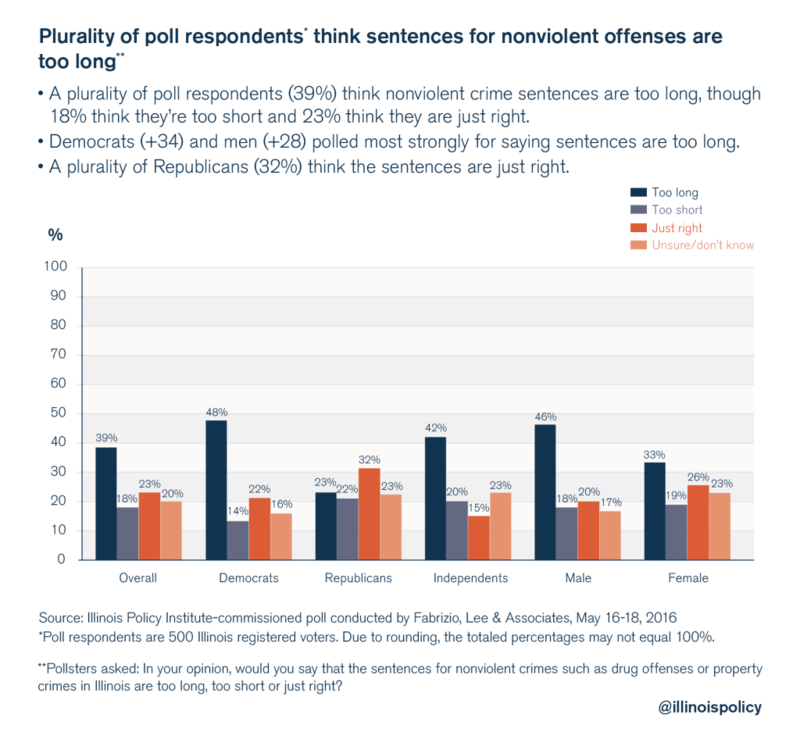 Data from The Pew Charitable Trusts show 30 states, including Illinois, have raised their felony theft thresholds since 2001. And these states had declines in property crime rates similar to those of states that didn’t raise their thresholds. In fact, property crime tended to fall slightly more in states that increased their felony theft thresholds. Pollsters asked respondents what they thought about increasing the felony theft threshold. They supported this reform by a 50 percent margin consistently across party lines. Respondents were overwhelmingly in favor of this idea. Another potential reform is to increase access to drug treatment and related programming to which offenders could be sent instead of prison. One way to do this would be to expand eligibility for Adult Redeploy Illinois, or ARI, a program that provides alternatives to prison for nonviolent offenders. Lawmakers could expand ARI eligibility by amending the Illinois Crime Reduction Act. Right now, participation is limited to nonviolent offenders as defined by the Rights of Crime Victims and Witnesses Act. But by making any probationable offense eligible, others who might benefit from treatment but are now ineligible, such as some repeat DUI offenders, would be able to participate, too. Expanding access to substance abuse treatment and mental health services could be more cost-effective than incarceration in such instances. There was strong support across the board for this reform. Eighty-six percent of respondents – including 92 percent of Democrats, 77 percent of Republicans and 83 percent of Independents – support allowing all probationable offenders to participate in ARI-funded programs. In all, respondents were consistently in favor of important sentencing reforms and expanding diversion programs. But are they willing to express this support at the polls? 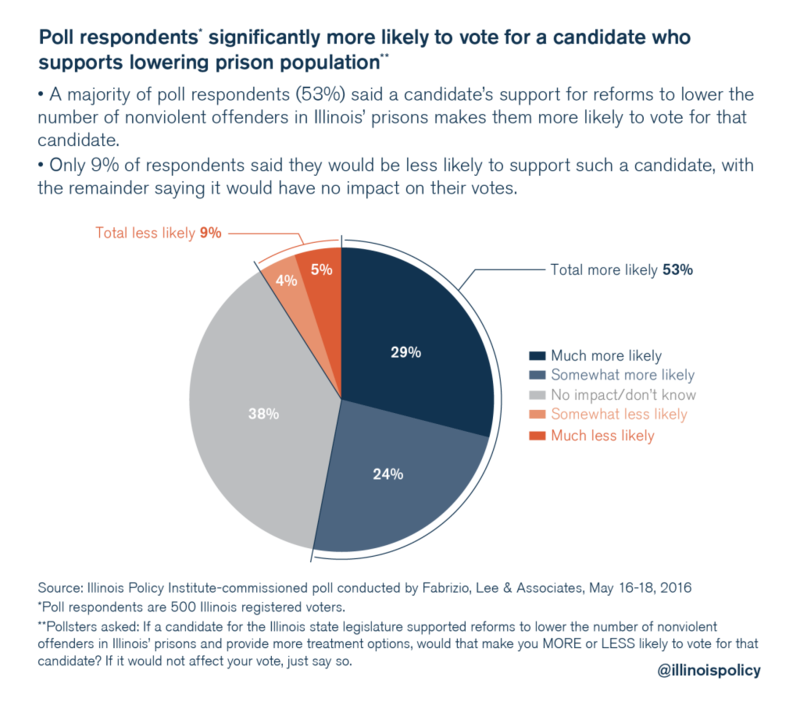 Pollsters asked this question and found 53 percent of respondents said a candidate backing reform to lower the number of nonviolent offenders in Illinois prisons is more likely to have their support. Each year, more than 30,000 people are released from Illinois prisons and face the challenge of re-entering society.14 The biggest obstacle to getting their lives back on track – and not returning to prison – is finding a good job. But instead of embarking on a clear path to becoming independent, contributing members of their communities, many ex-offenders find themselves up against a brick wall because of bad state policies that make getting work incredibly difficult. Pollsters asked respondents about three proposals that would address this problem by removing economic barriers to success for ex-offenders. 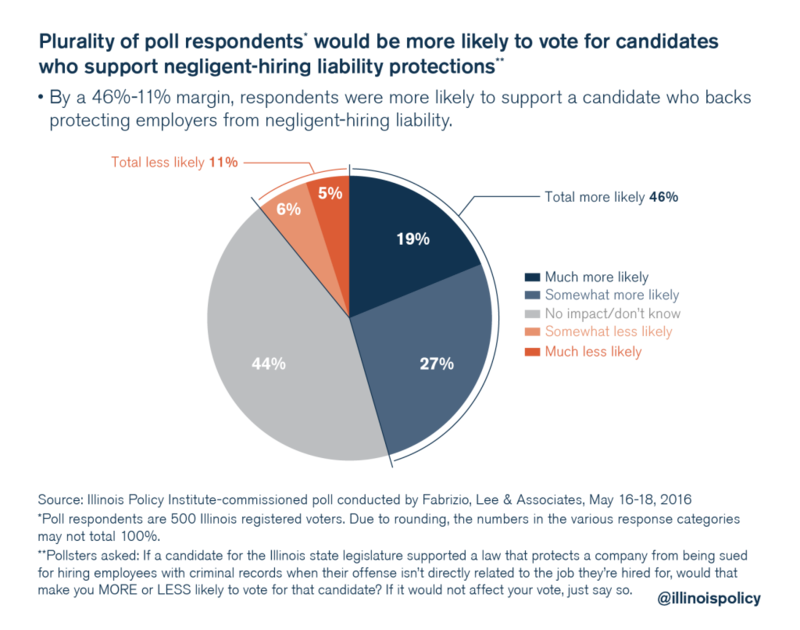 Respondents are more likely to vote for candidates who want to open up these job opportunities. Sealing is a process by which a former offender can apply to have his or her record closed to most viewers, removing one of the most significant barriers to employment for ex-offenders who have repaid their debt to society and will re-enter after serving their time. For an ex-offender to have his or her record sealed, he or she must successfully pass through an adversarial petitioning process in the courts. Even if a court approves a petitioner’s request to have his or her record sealed, law enforcement and certain employers can still see sealed records. Expanding sealing for nonviolent offenders is one way to lift the burden of a criminal record, which can keep many from finding employment. 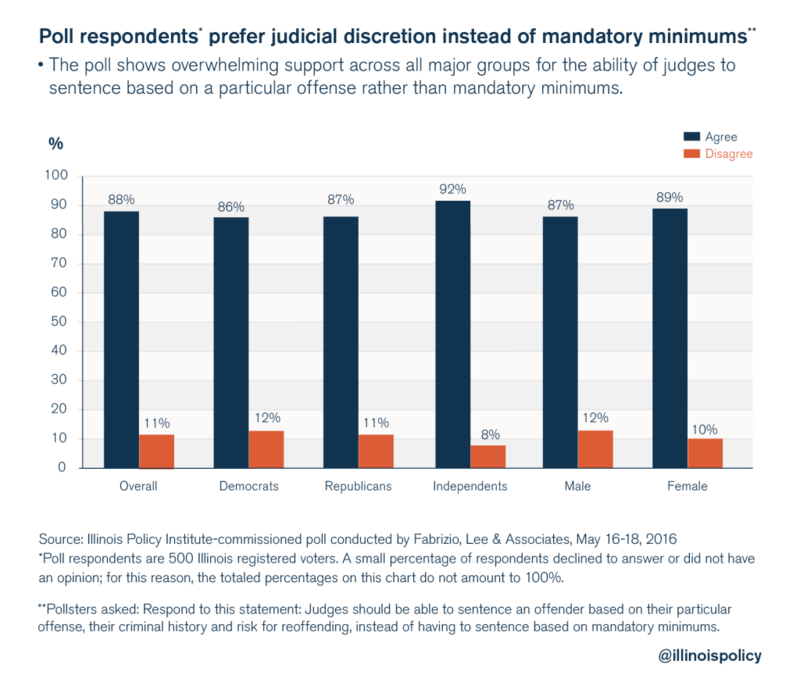 Majorities of all parties – 75 percent of Democrats, 66 percent of Republicans and 71 percent of Independents – were supportive of allowing nonviolent offenders to seal their records after they successfully complete their sentences. 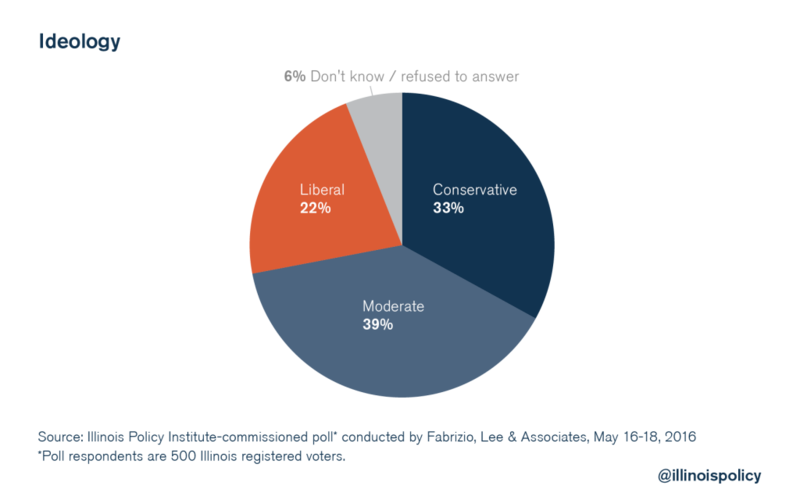 Respondents were also more willing to vote for candidates who support this. The largest percentage, however, said they either don’t know how much support for this issue would influence them or that it would have no impact. This indicates more education on the issue is needed to move the needle on sealing reform. Many employers are willing to hire former offenders but are concerned about the possibility of a negligent-hiring lawsuit if such an employee commits an offense in the future. One way to combat this would be for Illinois to limit negligent-hiring liability so that simply hiring someone with a record is not grounds for a lawsuit. Then business owners will be able to hire more confidently, without fear that giving former offenders a chance will put their businesses at risk. At the same time, responsibility for any new offense should lie with the person directly responsible for that offense. Eighty percent of respondents, including 82 percent of Democrats, 78 percent of Republicans and 79 percent of Independents, would support this reform. 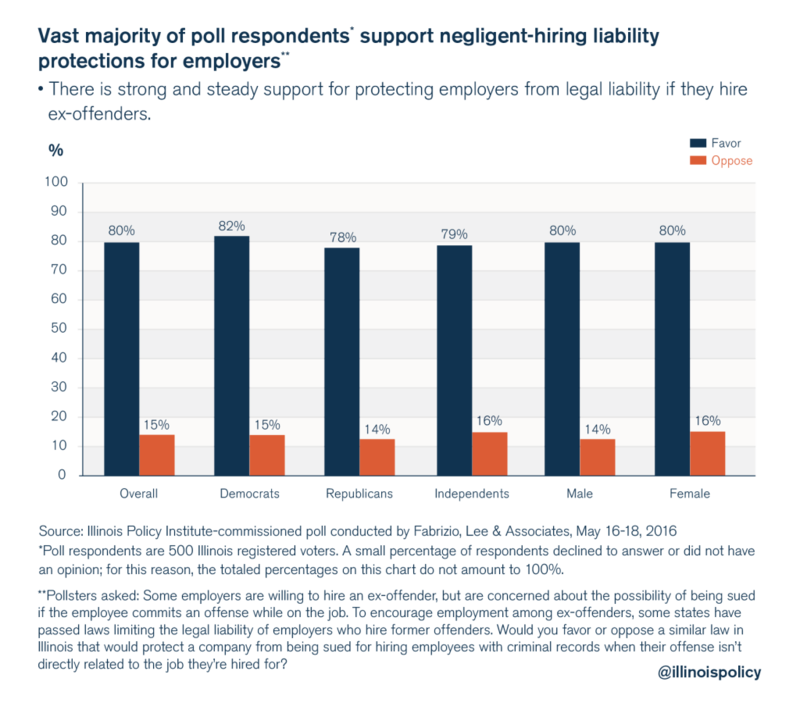 Pollsters also asked whether support for this reform would make the respondents more likely to vote for a candidate, and 46 percent said they would be more likely to vote for someone who supported reforming negligent-hiring liability laws. Civil asset forfeiture is a procedure that allows the police to seize private property they suspect was related to criminal activity, even without having to prove the owner of that property used it in a crime. 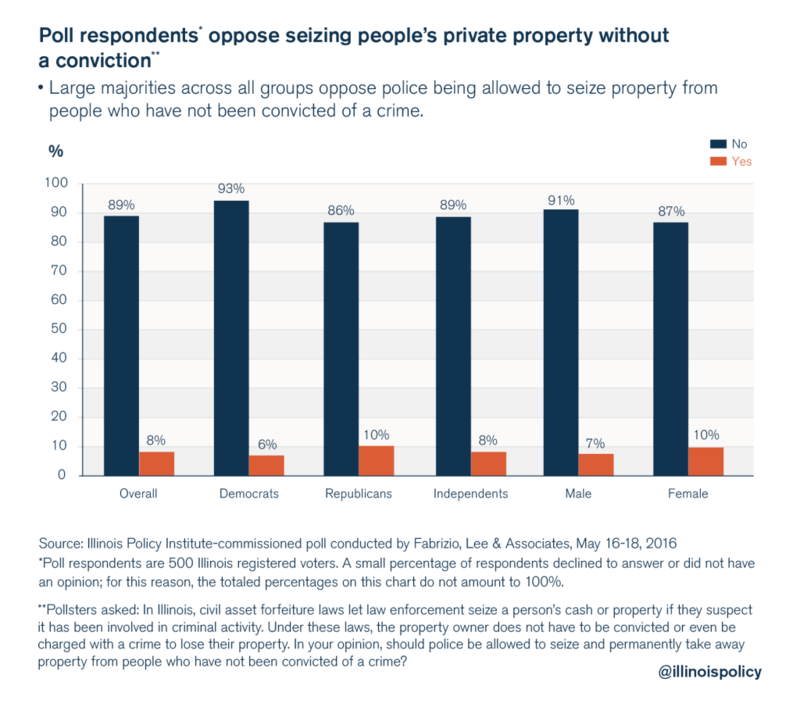 The response was negative across all political affiliations: 89 percent of registered voters opposed property seizures without a conviction. This includes 93 percent of Democrats, 86 percent of Republicans and 89 percent of Independents. 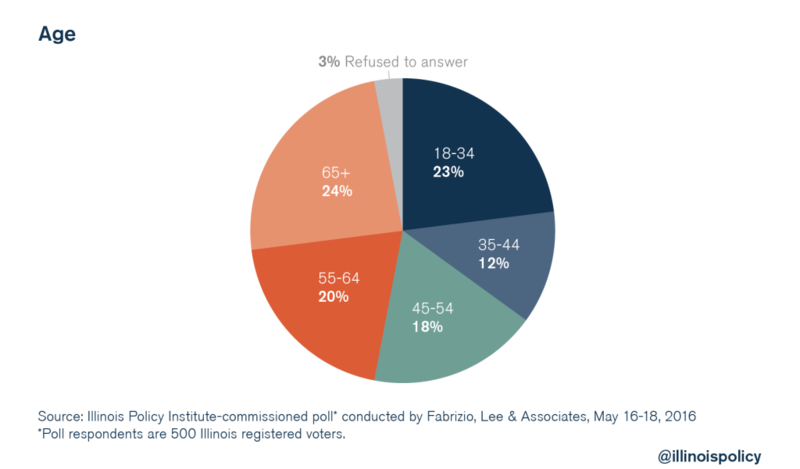 Additionally, most respondents – 54 percent – would be more likely to vote for a candidate who supports reforming these laws. Twenty-eight percent would be “much more” likely to vote for a reformer on this issue. 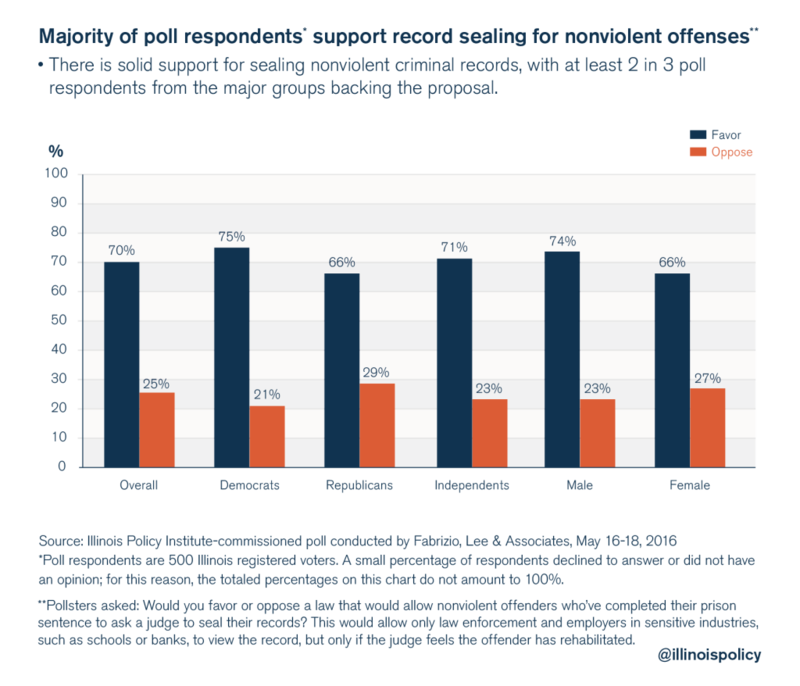 One last issue on which pollsters wanted to assess voters’ appetite for reform is bail policy. Yet many people accused of a crime stay incarcerated before trial because they’re unable to afford bail. A majority expressed openness to the change. 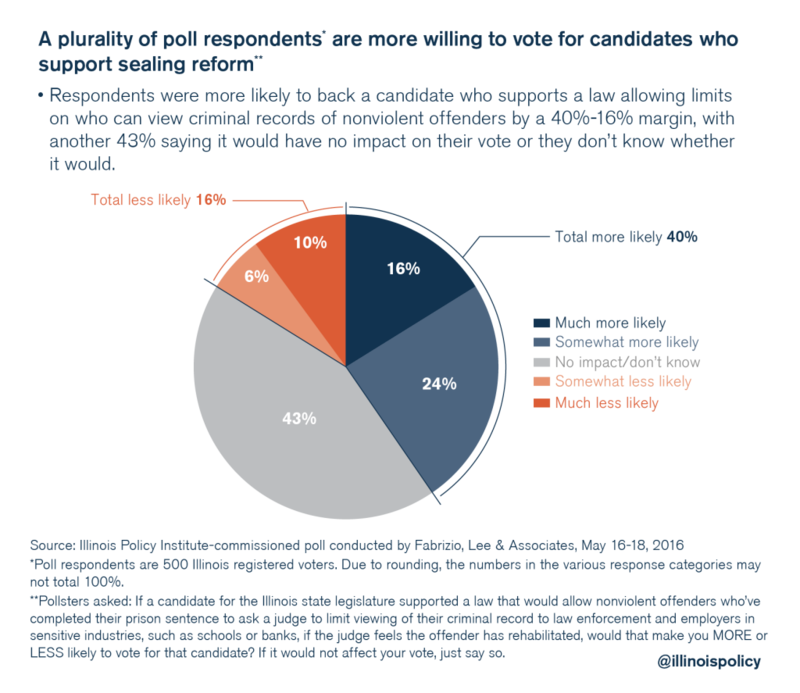 Sixty-three percent of voters would favor a risk-assessment rather than money-bail system. Of course, the details of such a reform vary. What this would look like is a critical question that deserves further debate and research. Illinois is a state ripe for criminal-justice reform. It has made substantial progress in 2015 and in 2016. Much remains to be done. Everyone – from liberal Democrats to conservative Republicans to those who fall in between – can find common ground on reducing incarceration for nonviolent offenders, removing barriers to work for people with records, and instituting other critical reforms that will make the state’s justice system fairer and more cost-effective so that state and local governments can focus more resources on offenders who pose a serious risk to public safety. Voters have made their support for criminal-justice reform known. They have said they will support political candidates who deliver. Hopefully, Springfield will heed the message and continue on the path to reform. 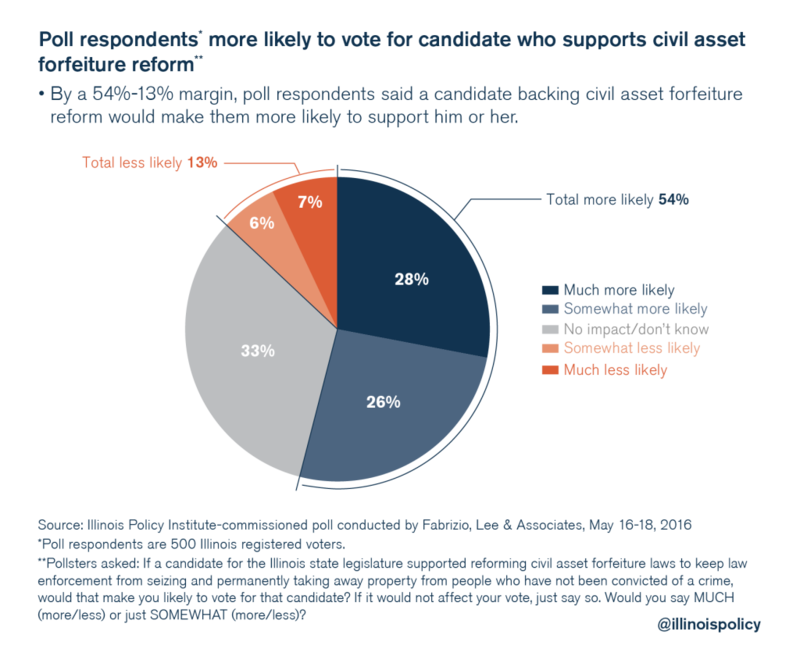 The following charts show the demographic breakdown of the 500 Illinois registered voters who answered questions for the Illinois Policy Institute-commissioned poll conducted by Fabrizio, Lee & Associates May 16-18, 2016.